More practical versions of the Mercedes-AMG C 43 have been unveiled in the shape of the four-door Saloon and five-door Estate models. The new C 43 Saloon costs £44,460 and the Estate £45,660. The two-door Coupe, incidentally, is £46,280. Order books are open now, with deliveries starting in September. The Mercedes-AMG C 43 is a slightly unusual model, in that it’s a fully-fledged AMG car (rather than a warmed up C-Class with AMG parts) but it sits alongside an even more powerful and more expensive C 63 model in the C-Class range. It’s akin to BMW releasing a Diet M3 or M4 Lite, if you like. It is not simply a lower-powered variant, however. While the C 63 is rear-wheel drive V8 with 457PS, the C 43 gets its 367PS from a twin-turbo V6 and is four-wheel drive. The weaker of the two packs two extra gear ratios though, coming with a nine-speed automatic. Aside from the additional headroom and rear legroom you’ll get with the Saloon and Estate versions of the C 43, the boots are bigger, unsurprisingly. 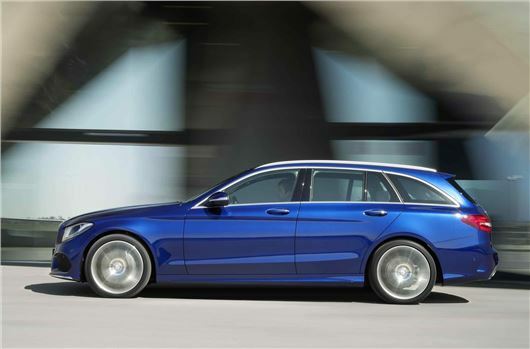 The 490-litre and 435-litre capacities of the Estate and Saloon respectively trump the Coupé’s 355 space considerably. The Estate’s stretches out to 1510 litres with the rear seats folded, although its extra bulk means it’s a little slower, taking 4.9 seconds to hit 62mph where the Saloon and Coupé both do it in 4.7. Elsewhere in the C-Class range, Mercedes-Benz has announced that lesser models will become available with 4Matic four-wheel drive for the first time, on the C 200, C 220d and C 250d models. The 4Matic option commands a £1500 premium over standard, meaning that a C 220 d 4Matic in Sport trim is £36,025.